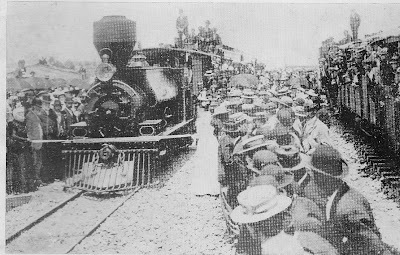 After years of planning, the people of Thames turned out in their thousands for the opening of the Thames Line (Thames to Auckland) on the 19th December 1898. A full report of the day and the history of the track are in a special Thames Star supplement put out on the afternoon of the opening. 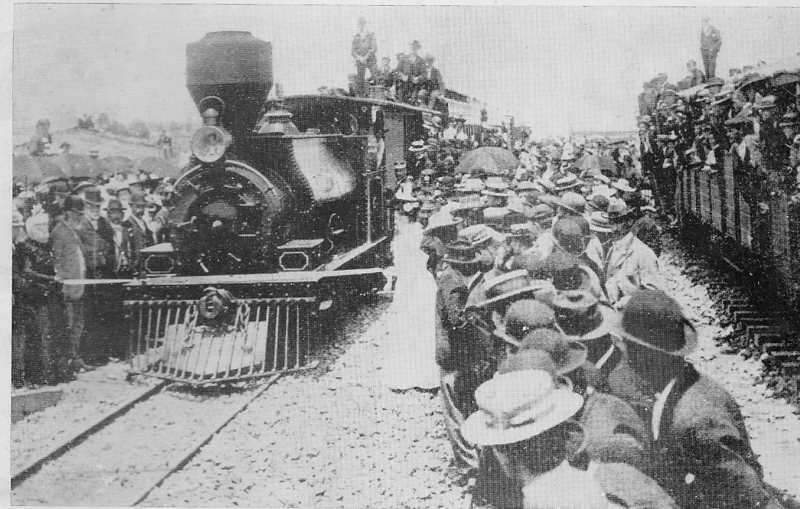 "As soon as the train steamed into the station from Paeroa, and as the engine arrived at the platform, it breasted a broad length of blue ribbon which was held across the line by Miss I Scott (sister of the worship the Mayor) and Mrs T A Dunlop. As the critical moment arrived, there was general and enthusiastic cheering." This railway line would go onto to prove to be a vital link for Thames businesses, specifically A & G Price Ltd who manufactured many Steam engines; but also in later years the railway was used extensively for transport by the Toyota car assembly plant. Just a quick mention of this wonderful pictorial resource available on Thames Hospital. In 1986 a display of historical photos took pride and place along the corridor adjoining the then main foyer and Ward One. Beautifully displayed in cabinets and with full details given where possible; many patient and visitor spent time looking at the photos. During a time of renovation these displays were taken down and taken to Waikato Hospital where a historic photo database was developed. 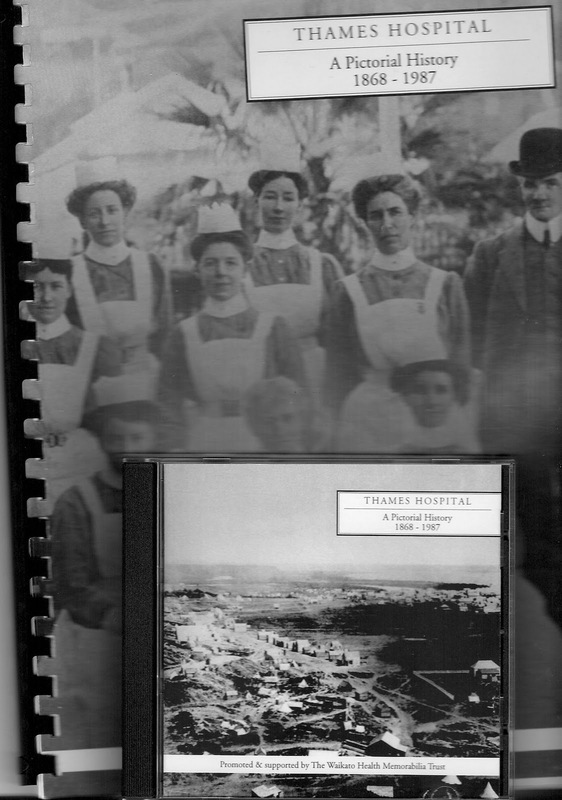 These are available for sale as part of a set: "Thames Hospital - A Pictorial History 1868-1987," a catalogue that identifies the photo reference and a CD with the photos on. A copy is also available to view at The Treasury, Thames. Mrs Oldham, Mrs Woolley, Miss Stewart, Mrs Steadman, Mrs Fairgray, Mrs Watson, Mrs Cahill and Mrs Murray. A summary of a couple of these follows. Miss STEWART - information on Matilda STEWART can be found here. Mrs FAIRGRAY, "was the first white baby born at the Thames. 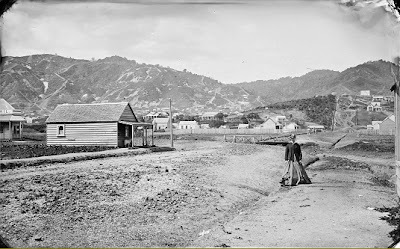 She is the second daughter of the late Mr James RENSHAW, and was borne in March, 1868. he married Mr J FAIRGRAY, of the Bank of New Zealand, Auckland, and since her marriage has resided at Devonport." Mrs CAHILL was born at Thames, daughter of the late T B WILLIAMS. After her marriage she helped run a grocery business in Thames near the Post Office. Mrs STEADMAN came to the goldfields when they opened with her husband, they resided at Tararu. Later they moved to a farm at Waikawau. Mrs John WATSON and her husband came to Thames just after the opening of the goldfield in 1867; and took a keen interest in all philanthropic and church work in Thames. Mrs T L MURRAY came to NZ in 1860 and married her husband in Auckland; Mr Murray came to Thames as the manager of the Bank of New Zealand. 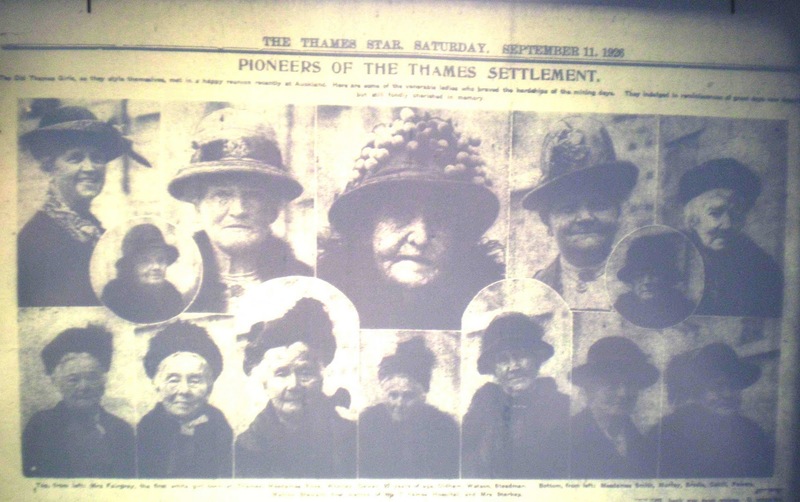 The majority of the Thames history books are filled with the men who founded and worked the Thames Goldfields with sparse mention of the women of Thames. There are two books of note that focus more on the women. "Diggers Hatters & Whores" by Stevan Eldred-Grigg has a few brief mentions of Thames women including MARY RODGER and ESTHER KEESING who had miners rights/claims on the goldfield. "To find a Fortune, Women of the Thames Goldfield, 1867-1893" by Rosemary Killip holds the most information on the lives of early Thamesite women. Chapters include: Founding Mothers, Helping Hands, Educators and Mentors, Entertainers, Outspoken Women, Enterprising Women and The Dissenters. Below picture: Top From left. Mrs Fairgray, the first white girl born at Thames, Mesdames Roke, Woolley, Dewar, 92 years of age, Oldham, Watson, Steadman. Bottom, from left: Mesdames Smith, Murray, Brodie? Cahill?, Pearceor Plenda?? ?, Matron Stewart, first matron of the Thames Hospital, and Mrs Starkey. 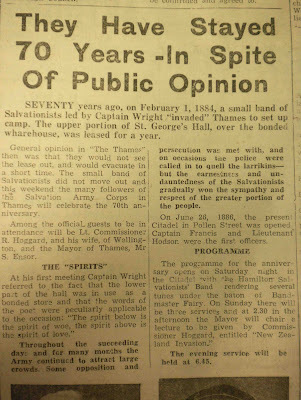 In 1954 the Salvation Army in Thames celebrated 70 years in the town. 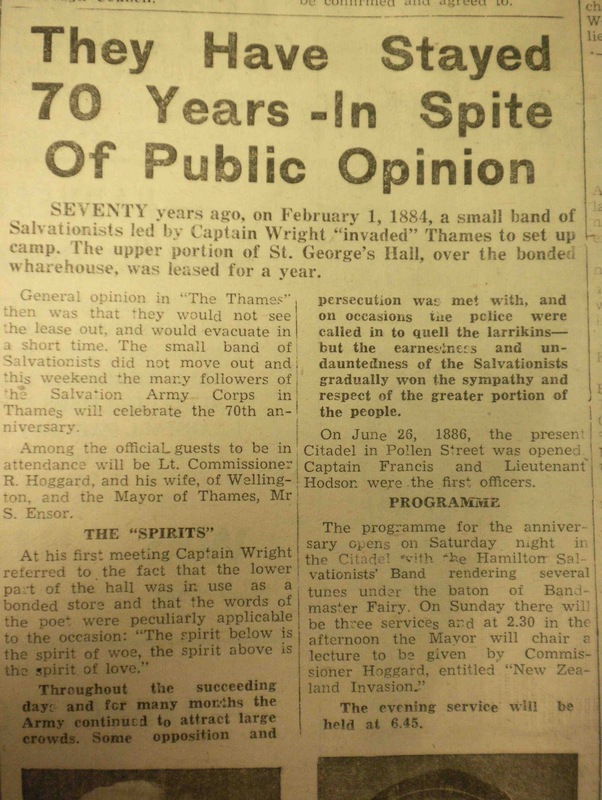 They reported that at the time the people of Thames did not think they would last the year. This was 1 February 1884, the Thames Advertiser reported on the meeting: "The control of the meeting was mainly in the hands of Mr Wright (staff captain), who, after the singing of the old hymn 'Rock of Ages,' read the 53rd chapter of Isaiah in a manner which showed no lack of either education or religious fervour." Initial worship was in the upstairs of a leased building, culminating in the opening of the Army Barracks in Pollen Street (Grahamstown end) on the 26 June 1886. An excellent resource is "Thames Corps History" by Cadets K & S E Trebilcock written in 1987. It contains many names, including the Corps Officers. For Genealogists looking for church records of BMD events the Salvation Army archives are available via email. 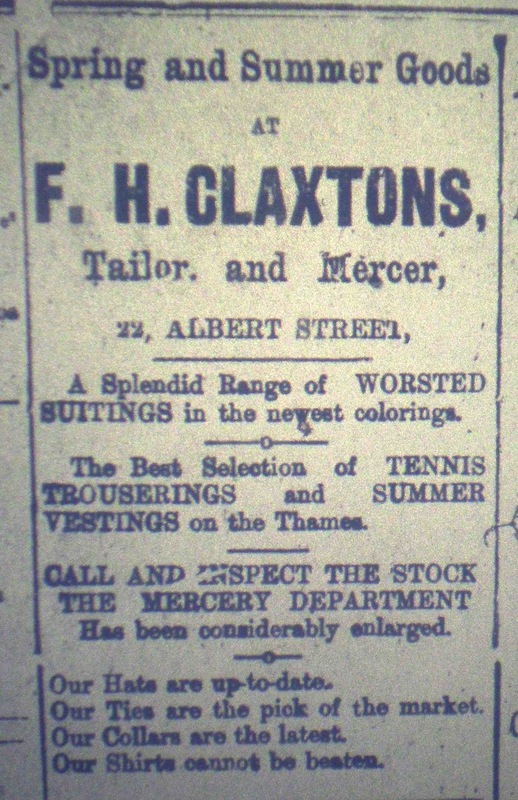 When looking at past businesses of Thames, several things emerge. One being the large number of shops in the Grahamstown area, in particular around Brown and Albert Street. In the 1900s the area was still hanging on, although trade must have dropped considerably when gold and the large number of miners had long gone. 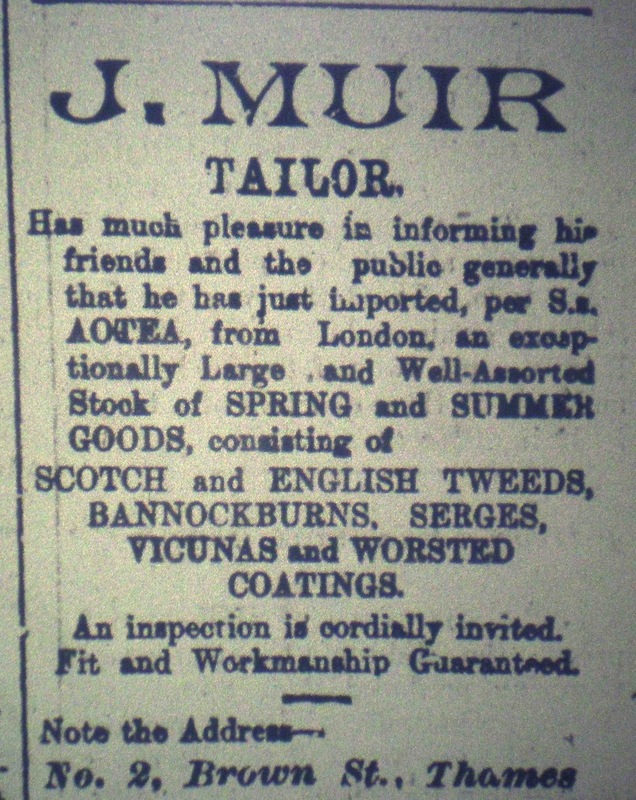 There appears to be a lot of drapers, milliners and tailors - no big chain, bargain shops in those days. 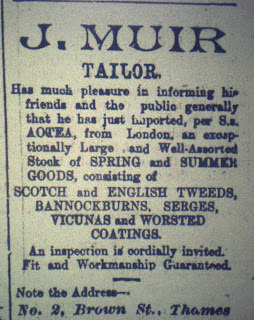 The advertisements below are for J MUIR (Tailor) and F H CLAXTON (Tailor & Mercer), of Brown Street and Albert street respectively. 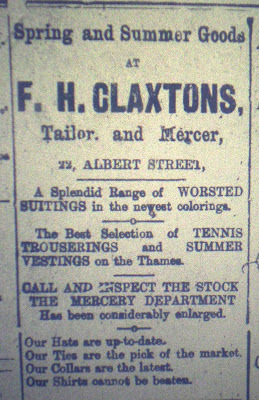 Who could resist these goods straight from London; a new shipment of goods from England was always quickly perused by their loyal customers. When looking at The Thames Newspapers at PapersPast, take some time to browse the full pages and view the wealth of information that the advertisements provide on the life of our early Thamesites.